Gail R. O’Day, a respected New Testament scholar and currently senior associate dean at the Candler School of Theology at Emory University, has been named dean of the Wake Forest University School of Divinity. She will become dean and professor of New Testament and Preaching on Aug. 1, succeeding Bill J. Leonard, who is retiring as dean. O’Day joined the Candler School faculty as an assistant professor of biblical preaching in 1987. She is currently the senior associate dean of faculty and academic affairs and the A.H. Shatford Professor of New Testament and Preaching. Leonard joined the Wake Forest faculty in 1996 to plan for the opening of the divinity school. The school opened in 1999 with 24 students in the first class. Leonard will remain on the faculty as chair of church history in the divinity school and the religion department. Provost Jill Tiefenthaler chaired the search committee. “Gail combines an outstanding record of teaching and scholarship with strong experience as an administrator and a sense of pastoral leadership that makes her the perfect person to lead the Wake Forest divinity school into its second decade,” Tiefenthaler said. A graduate of Brown University, O’Day earned a Master’s of Theological Studies from Harvard Divinity School and a doctorate in New Testament from Emory. She is an ordained minister in the United Church of Christ. From 1983 to 1987, she was an assistant professor of New Testament at Eden Theological Seminary, a United Church of Christ seminary in Saint Louis, Mo. She taught in the religion department at Hamilton College in Clinton, N.Y., from 1982 to 1983. At Emory, she has held a number of leadership positions in the Candler School of Theology. 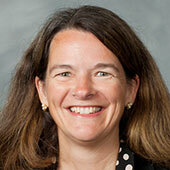 She has served as the school’s chief academic officer and directed the school’s recent strategic planning process. As part of the strategic planning process, she led the implementation of several key initiatives, including the curriculum for core degree programs and a student-focused advising system. She has also been a key leader in faculty development, including faculty searches, and in alumni relations and fundraising. Her research focuses on the Gospel of John, the Bible and preaching, and the history of biblical interpretation. She has written, edited or co-edited a number of books and articles, including, most recently, “Theological Bible Commentary” (Louisville Westminster John Knox Press, 2009) and “Preaching the Revised Common Lectionary: A Guide” (Nashville Abingdon Press, 2007). O’Day’s husband, Thomas E. Frank, is professor of religious leadership and administration at the Candler School of Theology. He will join the Wake Forest faculty as University Professor. In addition to Tiefenthaler, other members of the search committee were Jill Crainshaw (’84), associate dean in the divinity school and professor of ministry studies; Simeon Ilesanmi, Washington M. Wingate Professor of Religion; Rick Matthews, associate provost and chief information officer; Reid Morgan (’75, JD ’79), vice president and general counsel; David Hughes (’74), senior pastor of First Baptist Church of Winston-Salem; University trustee Mike Queen (’68), pastor of First Baptist Church of Wilmington; and Margaret Leinbach (MDiv ’03), chair of the divinity school Board of Visitors. An independent consulting firm, Heidrick and Struggles, assisted in the search process.